«Despite being an important figure in the recent history of Romanian Conceptualism, Geta Bratescu (who was born in 1926 and is still making art), remains widely unknown to the international art world. However, a recent exhibition at the Galerie im Taxispalais of a group of her works from the 1970s – including films, photography and reconstructed installations, which were displayed alongside the works of her contemporary, Ana Lupas – took a step towards redressing this. As in other Eastern European dictatorships, the art scene in Romania between 1945 and 1990 was deeply divided: on one hand, there was an ‘official art’ whose main function was one of state propaganda; on the other hand, there was a parallel, marginalized art scene that operated outside of public institutions and the media. Following a political thaw in Romania in the 1960s, the return to a repressive regime in the early 1970s drove many artists out of the country or to work in isolation. Bratescu worked as an illustrator and later as a graphic designer for the cultural newspaper Secolul 20 (20th Century) in addition to her artistic projects. Toward the end of the ’70s, she rented a studio that not only served as a place of work and as a retreat, but also increasingly functioned as the subject of her artistic practice, becoming a stage for temporary installations as well as a production venue for her films. 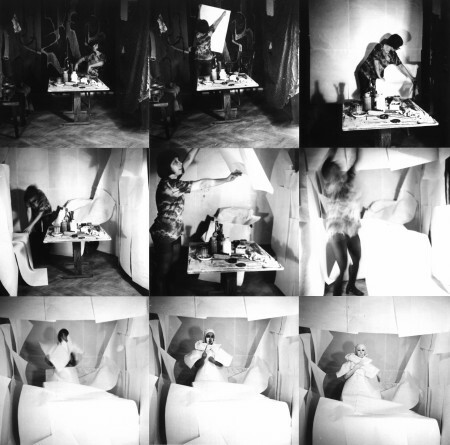 In an action documented on film entitled The Studio (1978), the artist used her own body to investigate her studio’s spatial proportions. The film opens with the artist sleeping amongst various objects on a section of floor marked in white. As fellow artist Ion Grigorescu moves the camera closer to her, Bratescu wakes up and draws a rectangle on the floor and adjacent wall – a quickly sketched form scaled to the artist’s own size and height. Next, she attempts to measure a diagonal cross-section of the shape she has drawn by lying on the floor and using the length of her body as a benchmark, but she falls short. She then interacts with various everyday objects and props lying around the studio: pieces of clothing, a folding chair, abstract paper cut-outs. Her movements seem improvised, and at times she has trouble handling all the objects at once – a tragicomic slapstick that the artist interprets as a serious performance. With the markings on the floor and the wall behind her, Bratescu creates an imagined stage within her working space. Yet her studio is also a living space – functional, everyday objects such as clothing or furniture repeatedly come into the camera’s focus. In contrast to her Western Conceptual contemporaries, such as Bruce Nauman and Paul McCarthy, Bratescu does not view the relationship between the studio and the body as independent from life’s daily problems: she aims constantly to dissipate the boundaries between the spaces of art and of everyday life. For another work in the exhibition, Bratescu reconstructed with updated materials her installation No to Violence (1974), the original of which is held in the collection of the Moderna Galerija in Lubljana but has been partly damaged. Smooth but untreated wooden poles and black cloth are bound into a mass while the joints of this strange figure are held together with medical bandages. Other pieces of wood lean against the gallery walls, ready for possible use. Bratescu also included a white, rectangular stage, reminiscent of her studio, on the gallery floor and added a roof-like construction of boards. The entire ensemble is illuminated from floor and ceiling by two simple desk lamps. At first glance, the arrangement could pass for an old-fashioned anatomical prosthesis, or possible tools to replace non-functioning parts of the human body.